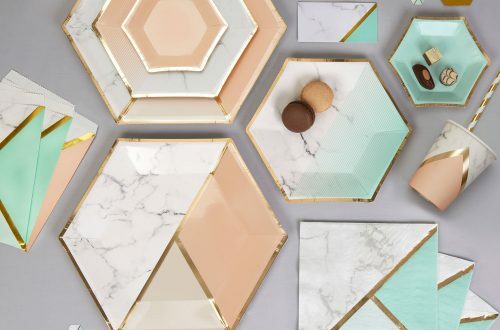 With “Scripted Marble” Neviti offers a new collection of decorative elements and accessories for your wedding this year which picks up those trends you just won’t be able to avoid at the moment: marble and metallics. The design combines beautiful marble detailing and glossy gold and offers fashion-forward couples a sleek and contemporary look for their wedding. A truly versatile range, Scripted Marble offers a muted colour palette to complement any wedding theme. 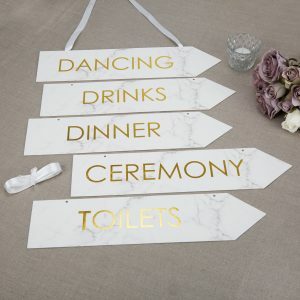 The collection makes it very easy to create a cohesive look for your wedding, starting with the helpful wedding signs in the “Scripted Marble” style which direct your guests to key areas of the venue. 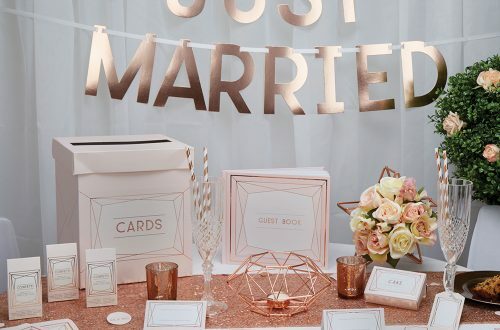 Gorgeous “Just Married” bunting decorates the reception hall or the wedding car and the candy bar, with matching sweetie bags ready for your sweet-toothed guests, is marked by a lovely “Love is sweet” bunting. 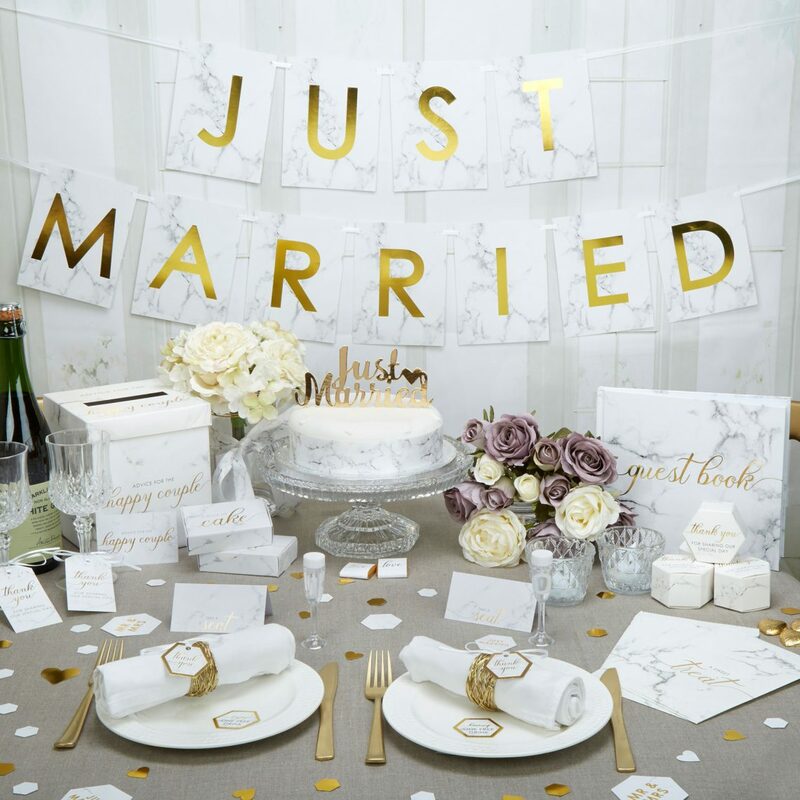 Interesting pieces bring your wedding table to life, including elegant place cards and scatter confetti, and the “Just Married” cake topper gives the finishing touch to your wedding cake. In addition, the matching cake boxes are an elegant way to offer guests something sweet to take home. 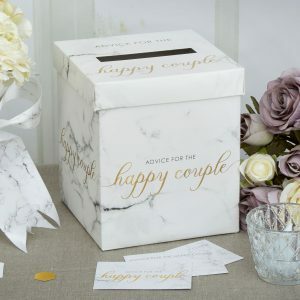 A cute wedding wishes post box collects your guests’ wishes and advice for the newlyweds (matching cards are also included in the collection) or serves as a money box for your honeymoon fund. 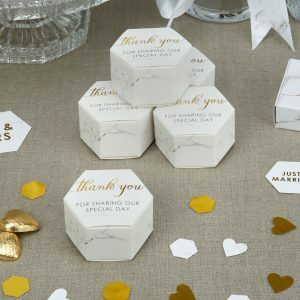 Guest favours are well kept in the unusual, hexagonal favour boxes and the matching tags pass your Thank Yous on to every one of your wedding guests. In our wide selection of confectionary you can find beautiful chocolate squares, wedding almonds or our popular “Just Married” and “Mr & Mrs” rock sweets which are just perfect as little favours for your guests. Especially our almonds or dragees in shiny gold fit perfectly with the theme and extends the glamorous touch into every detail. 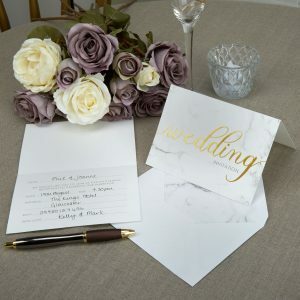 In addition to the decorative items the “Scripted Marble” collection extends the marble theme to all the necessary stationery, including “Save the Date” cards and wedding invitations as well as a gorgeous, traditional guest book for all the special memories of your big day. Offering something a little different, Scripted Marble blends a simple yet eye-catching design with glamorous touches to create a truly distinctive wedding scheme, perfectly fitting in with all the current wedding trends for 2017 and beyond. 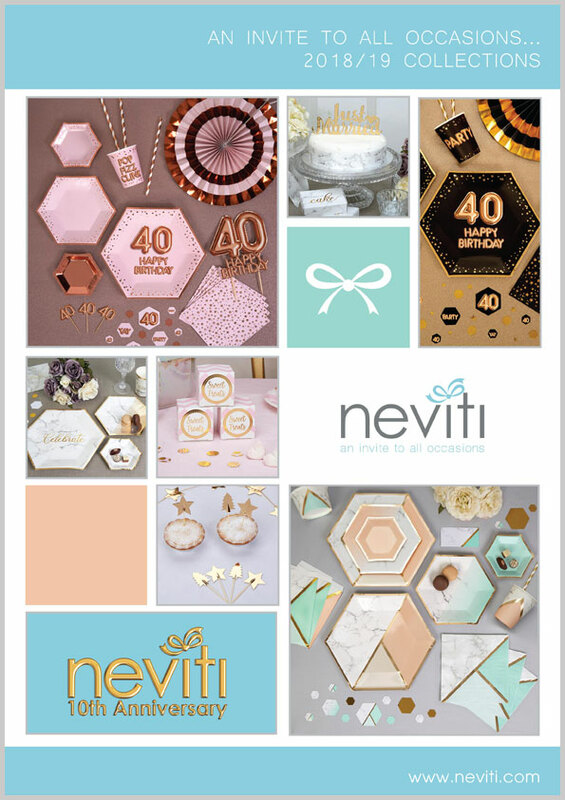 Visit www.neviti.com to take a look at the full Scripted Marble collection.